A farmer who was gifted an Only Fools & Horses-style three-wheeled car by friends has created a calendar based around the classic motor. Robert Wrinch, of Old Newton near Stowmarket, Suffolk, was given the Reliant Rialto - named Madge - for his 50th birthday by friends last year. 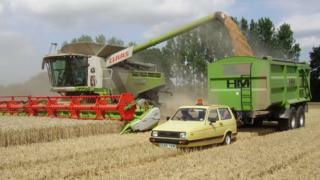 The group decided to create a 2016 calendar, depicting the car in a series of farming situations. Mr Wrinch said Madge is "always busy as there's plenty to do on the farm". Mr Wrinch said that although the car in the BBC comedy was a Reliant Regal, his friends delivered the Rialto dressed as Batman and Robin - aping the Del Boy and Rodney Trotter characters in the programme. "We've got a real good bunch of friends and every year somebody has a bright idea for a calendar and it's become a bit of a tradition," he said. "Madge has been helping with the harvest, herding turkeys, pigs and helping with dairy cattle - she's always busy as there's plenty to do on the farm." Proceeds from the calendar's sale will be donated to the Royal Agricultural Benevolent Institution. "If we can do something good out of something like this, then happy days."